Jaclyn and Jaimen had a destination wedding in Montego Bay, Jamaica. They had there ceremony and reception at the Royalton White Sands Resort. 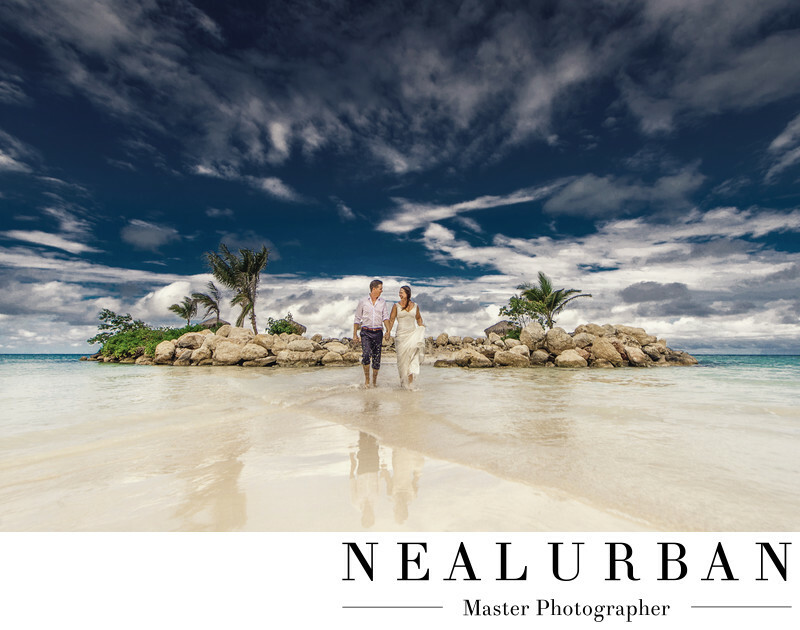 When we are asked to photograph destination weddings, we always try to put together a package that includes another day photo session. We do this because on the day of, most of these resorts have the ceremony and reception back to back. That does not leave us any time for photos. So we always ask the bride and groom if they want to do photos the next day. The stress of the wedding is over and we can get some fun images. Jaclyn and Jaimen loved this idea. They really wanted to take advantage of having photos done around the resort. There was random island in the middle of the ocean, not far from the resort. Guests could walk over on the sand bridge that connected it. We thought this would be a great spot too do some images. Neal had to to take this image in multiple shots and merge them together in post. We wanted the bride and groom to walk toward the camera through the water. But, we wanted the entire island in the image. Other than merging the images, there was no other post work involved. The clouds were super white and rolling in from the ocean. The water was an amazing bright blue. And the bride and groom went a bit more casual. They each had on their wedding attire wedding dress, and partial suit. It was really hot and humid, so we told the groom just to wear a white dress shirt and his dress pants. Then we told him to roll them up to go in the water. We had Jaclyn hold up her wedding dress. We told them to look anywhere but the camera. We wanted them to look at each other, talk, and have fun. This turned out amazing! The bride and groom had a sunset ceremony right near the beach. There was a gorgeous gazebo on the end of an ocean pier! We did have to take some time outs from family portraits on the day of, to get amazing sunset photos. There seems to always be a jaw dropping sunset in Jamaica. Location: Mountain Spring, Trelawny, A1, Montego Bay, Jamaica .